After a long list of coaching stops that includes Ole Miss, Duke, University of Colorado and the Dallas Cowboys, Mike MacIntyre is returning to Oxford as the Rebels’ defensive coordinator for the 2019 season. After being removed as the head football coach at the University of Colorado following the team’s unsuccessful 2018 season, MacIntyre inherits a defense that has struggled mightily in recent seasons. The Rebel defense gave up 36.2 points per game last season, good for 113th out of 130 FBS schools. MacIntyre is familiar with Ole Miss head coach Matt Luke as the two were on staff together at both Ole Miss and Duke in the 2000s. After MacIntyre’s hiring, Luke praised his new coordinator’s ability to revive defensive programs at his previous stops. 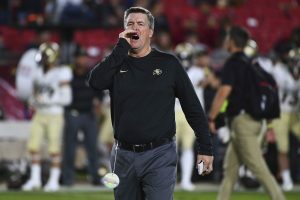 MacIntyre’s ability to revive programs earned him NCAA’s Walter Camp Coach of the Year Award in 2016 after leading the Colorado Buffaloes to their first 10-win season since 2001. Although he recently lost his job as the Buffaloes’ head coach, MacIntyre is excited about the prospect of working with Matt Luke in the SEC West in an attempt to remedy Ole Miss’ defensive woes. MacIntyre served as an assistant coach at Ole Miss under David Cutcliffe from 1999 to 2002 and looks forward to living in Oxford and coaching for the Rebels once again. Although MacIntyre’s last two coaching stops have been of the head-coaching variety, he said he is looking forward to working with head coach Matt Luke in Oxford. Although Ole Miss has struggled defensively since the tail end of the Hugh Freeze era, MacIntyre believes talent exists on that side of the ball that makes a turnaround in the 2019 season possible. MacIntyre has spring and fall camp to work with and tweak his new defensive unit, and he states that there is a need for week-by-week improvement. The Rebels’ first test of 2019 will be when they travel up the road to Memphis to take on the Tigers on August 31.